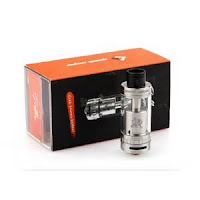 The Griffin 22 and Griffin 25 are rebuildable tank atomizers, or RTAs. They both feature Velocity-style build decks, and large bore Delrin drip tips, juice flow control, top fill, gold plated adjustable 510 pins, and capacious air flow with a fairly typical method of adjusting adjusting the airflow. Both tanks are made from stainless steel (although I cannot confirm what grade of stainless is used), and silica glass. The insulators are peek, and, at least on the 25, the grub screws are hardened. Both have build decks and bases that can be removed while the tank is full. They also have rings to trap and guide the wicks. The similarities end there, though... The smaller version holds around 3.5 ml, and has a 16.1 mm diameter deck, has an optional top-air adapter (which is why it holds "about" 3.5 ml... that airflow adapter eats up a bit of juice capacity), and does not come with a 510 drip tip adapter or single coil block adapter. I am unsure if the 25 mm version adapters will work it features a 17 mm deck. 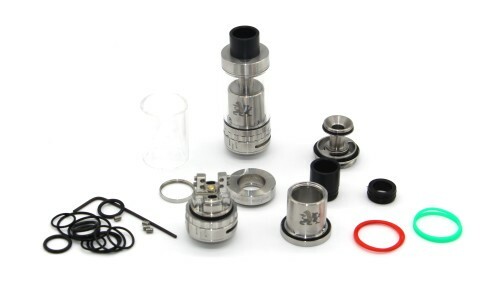 The 25 mm has a 6.2 ml capacity, comes with two single coil adapter block (one with air and one without), and a 510 drip tip adapter, OR a 6.0 ml capacity and the top airflow thingy already built in, and all of the other goodies, too. There is no adapter that I am aware of at this time for the 25 to convert it from one style to the other as there is for the 22 mm version. The 22 mm has a smooth airflow adjustment, where the 25 mm has detents. Finally, the juice flow control on the 22 mm spins rather freely, and the juice control on the 25 will stop, and loosening too far will unscrew the tank. The prices of the various set ups is surprisingly similar, too. The stainless 22 mm can be had for $36, the black for $39. The stainless 25 (no top air) can be had for $35.90. The black 25 (no top air) is $36.90. With top air installed in either 25, it adds $2 to $3. The top air piece can be purchased for the 22 for $8.90 in stainless and $9.50 in black. Similar? They are all between $35 and $40! All of those prices are based on what is available (or as a pre-order) from HeavenGifts.com. It is certainly possible to find them elsewhere. There... all of that, and it appears that there are as many differences as there are similarities. However, most of the differences are small refinements, and the similarities carry the day. Everyone seems to be raving about these tanks. Are they that good? Let's start with the yes! This tank is easy, easy, easy to build on. Once again, the Velocity-style deck makes installing coils simple. The large-ish post holes (1.2 mm) allow for a wide variety of builds. The 16.1 - 17 mm deck allow for larger builds than are possible in the average RTA. I love the ability to remove the base and deck without having to empty the tank. The juice flow control and top filling allow for easy and leak-free top offs. The wick retaining ring makes wicking a breeze, too. It acts as a trap so the wicks do not get crushed or mussed when installing the deck, but also as a guide to prevent over or under wicking. The capacity ranges from decent to great, falling just short of awesome (for that you'll want the Boreas). Of course, the capacity is not as much an issue with a top filling tank. The tank also looks pretty nice with some subdued branding on the top cap and a nice logo on the atomizer chamber. The branding and logo on the black version are a little more stand out, but not annoyingly so. I also like seeing that the stated measurements are what they are supposed to be. 25 mm is 25 mm or less. 22 mm is 22 mm. The bowing and banding that some tanks use (Crown, Billow V2, Boreas... I'm looking at you) annoys me for some reason... Most likely, I am annoyed because they do not fit properly in side-by-side mods such as the eNVy 22, Knight V1, Disguiser, and XvoStick. Both tanks come with a spare glass, and the Griffin 25's spare is nicely frosted. There are also spare grub screws, o-rings, and the necessary tools. The 25, and many other newer GeekVape devices are now shipping with a nice T-Tool featuring two hex and one philips. Sweet! The machining on both tanks appears to be great. I have found no metal bits and no machine oil residue on either (of course, the 22 was a used unit, so it might have been filthy, but I doubt it). I also am a fan of the included wide bore Delrin drip tips which are the same for either tank. There is some discrepancy with what is included with, or available for, the different tanks. The accessory packet that comes with the Griffin 25 is top notch! There are a bunch of o-rings, a very nice T-Tool, spare screws, two styles of single coil adapters, and a 510 drip tip adapter. The Griffin 22 comes with a much sparer kit with no single coil adapters, just a plain old hex wrench, and fewer o-rings. I am also disappointed to see that the top airflow adapter is not available (yet) as an add-on for the 25 as it is for the 22. I would like to try that on the 25, but I'm not going to spring for an entire separate tank to do it. 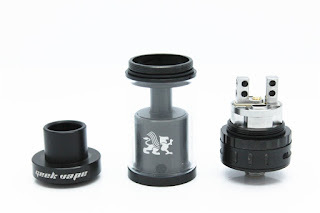 The included 510 drip tip adapter sets flush into the top cap. This can make it difficult to remove at times. I have found that if I apply some angular pressure to the 510 drip tip as I remove it, the adapter comes out, too. I've noticed that very few of the tanks coming out today ship with any kind of wick and wire. I suppose that's understandable... I have never used any of the wick and wire that came with any of my tanks, but I still kind of miss it. Some have complained that wicking higher VG juices is problematic as the distance between the glass and the chamber is very small. Very thick e-liquids do not traverse that narrow gap very well. I have vaped as high was 80/20 and have had no issues. I suppose if I attempted to vape something as thick as pudding, I might run into problems. Finally, as with so many other RTAs and SubOhm tanks on the market today, they are catering to those that want the wide open air and massive cloud experience. For the more part, the mouth-to-lung vapers are, again, being left out of the equation. I was able to put a mouth-to-lung build in the 25 mm tank by using the single coil block and tucking a 3 mm ID, 7 wrap, 26 gauge Kanthal A1 build on the open side. I also put a small bore drip tip on top using the included 510 drip tip adapter. I had to close the air all the way off. I also made sure that the juice flow was turned to about half off. With this I've been happily mouth-to-lunging at 13 watts on the original Kanger KBOX. Without the single coil adapter, and the 510 drip tip adapter, the standard Griffin RTA is not nearly as MTL friendly. But, then again, if a MTL vape is wanted, there's no reason to be researching this tank. The tanks arrive in very nice plastic clamshell boxes. The 22's was encased in a sleeve. If the 25 came in s sleeve, I promptly lost it. The 22's case was rectangular with the spare glass at the bottom, the tank at the top, and the spares underneath the foam insert. The 25's case was square. The tank was to one side, and the spares - including the glass - were under a flap covering another raised section of foam on the opposite side. I really, really like the way the 25 was presented. The 22 was, enh... nice, but just typical. Since receiving these tanks, I have run through five builds (three in the 25 tank, and two in the 22). The builds have ranged from simple single spaced coil builds through to bigger Clapton builds (I got lazy and used some Thunderhead Creations Clapton Wire Shots 28/24). I've run the tanks from as low as 8 watts, up to as high as 100 watts. I might have been able to go higher, but that's a bit outside my comfort zone. In all of that, I have yet to have any leaking issues outside of condensation, and I have had no dry hits as long as there was liquid in my tank. I tend to be a rather absent minded vaper when working on the computer, and I did vape one of the tanks dry once while a high-powered Clapton was installed. Ouch! The flavor and vapor production has been outstanding in almost all modes. Almost... Trying to get a decent MTL vape, again, was a challenge. Accessories are a bit of a jumble as to what is available for one tank or the other... I would like to see things standardized so what is available for one is available or included with the other. It can be difficult to remove the 510 drip tip adapter as it sits flush. That's really it... I like these tanks! Let's give 'em a grade. Finish - 10/10 - I could find no flaws in the finish of either tank, and the presentation was nice, although I prefered the 25 to the 22. Final - 9/10 - A grade. Get these tanks! If only one, get the 25! Just a side note... I understand the use of grub screws. They're a necessary evil. However, I would really, really like to see all manufacturers move away from hex or allen keys for adjusting them. A flat tip or philips head would be, in my opinion, far less easy to strip. I am adding this side note to this blog entry because I had to buy another Crius after seriously stripping one of the grub screws. Thank you for this. I was trying to decide between them for a future purchase. I think the 25 would be the one for me also. If you use the correct torque on these tiny grub screws then they aren't a problem. If only everyone had an idea what "tight enough" is! Good review though, spoilt by the footnote. Yet another great review and thanks for the info regarding differences between two decks. I have the 25 and love it and was considering the 22. I was wondering about deck size. Those new fandangle tweezers come in handy which surprised me since I considered them a novelty. But I have problems getting tanks off and there are two different size grip points on them. Also, for those really stubborn tanks, the points fit nicely into the top juicing holes and give good leverage. Better than needle nose plyers that can crack tanks.